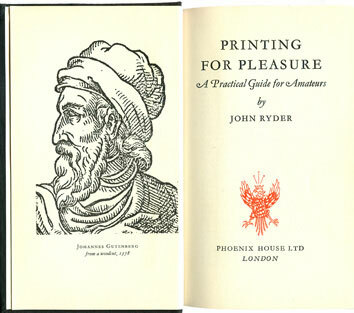 First published in Great Britain in 1955, and revised in 1976, Printing for Pleasure remains the best primer on letterpress printing for the hobbyist. 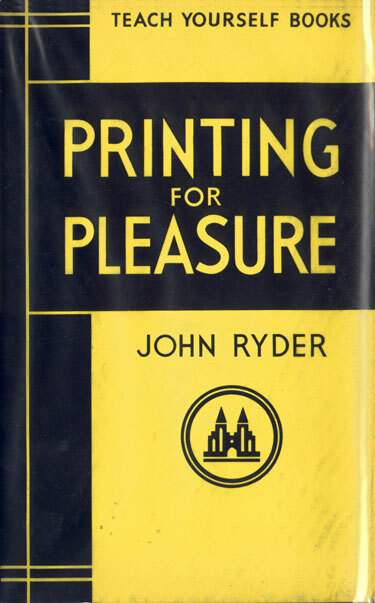 The book’s aim is to foster the enjoyment of printing as a hobby, to seek “pleasure as profit” (perhaps a wink to Charles Francis’ Printing for Profit published in 1917, the year of Ryder’s birth). It conveys seasoned enthusiasm and sound advice; provides straightforward explanations of basic printing techniques and clear definitions of printing nomenclature; and reveals a well-ordered design with delightful illustrations, many of which were reprinted from notable fine private presses of the period. 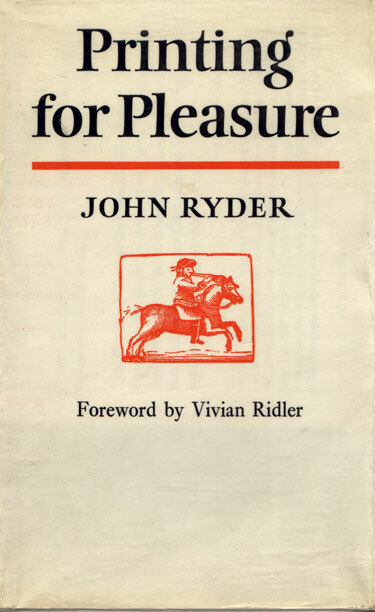 Ryder urges the reader to develop a taste for experimental techniques such as inking small objects and printing on alternative substrates, “since it is here on the amateur’s workbench (a place which the time-sheet and the wage-bill are absent), that experiments can be made and repeated without end and without fear of bankruptcy.” It touches on all the major considerations of setting up a hobby press, its chapters are logically ordered step-by-step, each building upon the knowledge of the previous one. It begins by addressing one’s attitude toward this endeavor, that is, how to proceed with the right spirit to maximize the pleasure to be derived and to avoid the possibility of drudgery. Next considered is the kind of press one should acquire and the physical space it shall require. This is followed by the choice of typeface, and then how to handle and arrange them, and finally how to ink and take impressions. With the technical instruction dispatched within fifty pages, the author turns to a brief history of the “little presses” 1 Little is an unsatisfactory word to describe these presses. While it does infer modest numbers of output issued in small quantities, the phrase has a derisive ring to it, which I believe Ryder did not intend to convey. In the 1960s, “little presses” was one phrase used to describe publishers of the literature of the protest movement. B.E. Bellamy notes in Private Presses and Publishing in England Since 1945, that the publishing of poetry was undergoing rapidly change and that “many younger writers and poets were seeking alternative ways of having their work published. One of the traditions they rejected was the letterpress printing of the private presses.” Faster and cheaper duplicating methods then appearing made the choice easy. For the first time nascent publishers could access the means of production with little capital and lead to a permanent situation that has allowed greater numbers of people then ever before to circulate their thoughts on paper. Bellamy comments that “the little presses are intent on pursuing their own way and there is very little acknowledged connection between their work and that of the private presses….” The gulf has become even greater since 1980 when his book was published. Since then one could point to the the widely divergent ‘zine culture, of the 1980s, to say nothing of internet blogging. beginning with William Morris by way of introduction, but informs the reader that the existence of private presses goes back at least 350 years. He goes on to highlight several eighteenth century proprietors including Horace Walpole and Benjamin Franklin. This history of private printing is inextricably woven into the fabric of the larger history of printing. In his bibliography for Printing on the Iron Handpress Richard-Gabriel Rummonds cites both editions, saying of the first that it is “Probably the best guide ever published for amateur printers. Well written and illustrated to stimulate an interest and pride in fine craftsmanship.” His praise is exponential for the revised edition calling it quintessential and saying that “Ryder brings style, intelligence, and inspiration to his subject.” All true. He then counsels that it “briefly touches on handpress printing, but intended primarily for users of Adana tabletop platen press”. While true, even those chapters of Printing for Pleasure dealing directly with the operation of an Adana do not preclude something to learn for those amateurs who might encounter other presses such as a Vandercook. Printing for Pleasure reached its mature state with The Bodley Head edition. Numerous copies still circulate in libraries and a search of online booksellers will yeild multiple copies of each edition throughout North America2, the United Kingdom and Australia. David Chambers, former editor of The Private Library, in an email to the present writer, wrote, “There had been talk of a new edition from Oak Knoll, with an appendix by someone who knew about computer setting, but the original edition was still in print, and in the end the idea was dropped. The fact is that the original book served to inspire a generation of printers on the handpress, but computer setting and printing needs an entirely new book, though with John’s sort of spirit pervading the text.” In his letter to this writer, Mr Ryder noted that a contract with Oak Knoll was dated and signed January 1996. Originally priced at 9s. 6d (USD $2.75, 1999), This edition is bound in black buckram and gold stamped on the cover with the main title set in Bulmer capitals running the length of the spine. On the front of the dust jacket the type (Plantin) and main graphics are printed black with a background line art image of an iron handpress (Clymer’s Columbian press3) printed van dyck brown. Below the three line title are two rampant lions holding up a white shield whose text in small caps reads: “With a foreword by Sir Francis Meynell”. A publisher’s advertisement on the back of the dust jacket lists three other titles from Phoenix House. The last of which is Sketching for Pleasure. The interior was set in 10 pt. Garamond (stated in the text, p. 38) justified — solid, no leading. Printed in three colors (black, red and cyan) in an edition of 8,000 copies. There is a half title, followed by a frontispiece of Gutenberg. A full title on the recto that includes the subtitle, A Practical Guide for Amateurs, does not appear on the title page of The Bodley Head edition. The publisher’s device is printed red and imprint printed black. Overleaf a dedication is made to his wife and to his publisher. At the bottom of this page is a notice of copyright made under the Berne Convention. The foreword by Sir Francis Meynell, author, designer, and proprietor of the Nonesuch Press praises the book for its wise words and practical considerations. Meynell makes three supplementary comments to move the amateur along. The first two regarding equipment and live instruction are brief and to the point. The last regarding style begins well enough, but quickly becomes tangential by writing at length about the work of a typographer unknown in England, thereby shifting the emphasis from Ryder’s text. In his favor, Meynell could turn a phrase of the sort reviewers loved to quote—all the better for Ryder’s book. The acknowledgments contain the names of several prominent professional typographers and bookmen of the era, yet another indicator that John Ryder was well placed in Britain’s postwar nexus of professional and amateur typographic enthusiasts. The appendix has five two-page spread specimens of book types with line art and a short text about the letter design on the verso and a large display size alphabet setting on the recto. The last page of the appendix is a showing of several display faces (script, titling, shaded, egyptian, clarendon, blackletter, inspirational, and calligraphic). This first edition concluded with a colophon featuring a large ornamental initial C as a pressmark, text simply states in all cap: “Printed at the” above the initial and “Chiswick Press | London | 1955” in three lines below. The famed Chiswick Press, printed the first book for The Bodley Head, and the early publishing efforts of William Morris. Later they were printer for the Golden Cockerel Press. This edition is still serviceable and remains of interest, if only because it contains illustrations omitted in the revised 1976 edition including: informative tables pertaining to weight of presses on pp.26, 28, and 32; a specimen page of border units on p.45; and drawing of “A forme with type locked in both directions” on p.55, and some amusing linocuts on p.87. An American edition appeared in 1956. Bound in red buckram, it was made from Phoenix House sheets. The dust jacket was not modified and the only alteration to the book is found on the title page where a paper label with the name Charles T. Bradford Company and their street address is pasted over the original imprint. (for five signatures): A*, B, B*, C, C*, D, D*, F [sic], E.
Curiously, several illustrations printed black in the Phoenix House edition are printed in red or blue (pp 22, 33, 39, 49, 51, 71). Because they did not produce this reprint, the Chiswick Pressmark is omitted. Mr Ryder, in his letter to this writer, states the press run totals for reprints in 1957 and 1958 at 10,000 copies each. The total for a third reprint in 1965 is unknown. 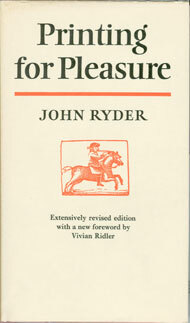 In 1976, Mr Ryder, then art director at The Bodley Head, revised the text and typography of Printing for Pleasure. Originally priced at £2.50 (USD $5.95, 1999), this edition is substantially more sophisticated in editorial organization and design than that of the first. There are enough additions and omissions in the new edition to persuade a librarian or bibliophile to acquire both for the sake of comparison. It is bound in red paper and gold stamped on the cover with the title running down the spine in Ehrhardt type in approximately 60 pts. U&lc. This is followed by the author’s first and last name in small caps of the same size. The Publisher’s name is set in two lines to read across the spine width in approximately 14 pt. caps. The cover of the dust jacket is the white of the paperstock, all text is black, and all elements are on a center axis, The title is set in two lines in a vigorous U&lc hand lettering, that is most assuredly the work of Michael Harvey. Separating this from the author’s name is a 6 pt horizontal rule printed in a warm red. Below the author’s name is a graphic, printed warm red, of a man on horseback at a gallop with a bugle raised to his lips heralding the text. 6 Below is the notice, set three lines in Ehrhardt types, that this copy is an “Extensively revised edition | with a new foreword by | Vivian Ridler”. The dust jacket spine is of the same layout as the book spine, except that the same cover hand lettering is used for the title and full author name, the former in black and the later in red. The back of the dust jacket stands in striking contrast to the front. The effect is of a negative where the whole page is, a full bleed in black. The single line art image of an iron hand press, printed red, occupyies the space. Although it is a different drawing than the one used on the first edition, the press depicted is, again, Clymer’s Columbian press manufactured in 1821. The dust jacket’s wrap-around flaps are free of color, and so resemble the cover. Front flap copy, printed black, is set unjustified (quite ragged with one unfortunate word break) in the same size and face as the interior. The blurb, with brief synopsis, is free of hyperbole. At bottom is the ISBN and U.K. net price. The back flap copy is an author bio. At bottom is a black, horizontal rectangle keyline box, inset is the publisher’s name — using Harvey and Ryder’s expanded clarendon-style lettering — printed red, in two lines bisected by the publisher’s street address in London, printed black. It is printed in three colors (black, red and cyan) in an edition of 4,000 copies at the Stellar Press (of which Mr Ryder was a director). The interior was typeset in 10 pt. Ehrhardt type (as stated on p.34 and on the copyright page) justified with 2 pts. leading Ehrhardt is a thoughtful design for text composition. Its contrast between hairlines and stems are not too extreme and its narrow set does not draw attention, but recommends the face to designers when the format is small and thus the measure narrow. The ranging figures are well drawn, but perhaps they ascend and descend a bit much. The italic appears to have wider inter-letterspacing. I am reminded of Stone Print, another successful condensed face of more recent design. However, it seems to possess less vigor in display as shown in chapter titles. With that said, it does have real presence when set in all caps as opposed to U&lc as shown in the well-made title page. There is a half title, followed by a list of books by the author, then a full title on recto, which as noted above, omits the subtitle. Mr Ryder’s personal bookplate device is printed red, and at bottom the publisher imprint is printed black. The overleaf contains the same dedication made to his wife and to his publisher as was in the first edition. At the bottom of this page, John Ryder is named as copyright holder, followed by the ISBN, publisher’s name and address, printer’s name and address, typeface (here described as Monotype Ehrhardt), date when first published, and date when revised edition published. Leading has improved the appearance of the uninterrupted text page; and likewise tables and lists and small caps throughout. Running heads have been omitted and page number placed at bottom center. Captions are set in the same manner as in the first edition. As announced on the dust jacket, a new foreword by Vivian Ridler — University Printer to Oxford and a private printer since the1930s — replaces the one by Sir Francis Meynell used in the first edition. This was a sound editorial choice as Ridler’s text stays on topic and its friendly, inviting tone matches that of Ryder’s. Ridler relates his own boyhood fascination with printing and how he could have benefited from this book had it existed, then writing that, “John Ryder would have soon put me on the rails. His book is compact, brief, and deals with essentials. By essentials I mean not only the techniques of printing, assembling the type and transferring ink from type to paper. If you are a beginner, it is just as essential to have some knowledge of the art of typography, and you will find it set down here with enviable concision.” Well said. A comparison of the table of contents of both editions will reveal that Mr Ryder reordered his chapters moving “The Little Presses” which outlines the history of private presses back two places and rewording the title of the next. This is telling, chapter 9 in the first edition “Everything You Need is Easy to Get” is changed to “Where to Buy Your Equipment”. In this chapter’s first paragraph, he addresses the fact that the lithographic printing method dominates the industry, and that computer filmsetting would soon relegate “the casting of hot metal types to become a process of historic importance rather than daily use.” The importance of this technological change for the amateur is one of degrees. In the next paragraph, Ryder acknowledges the law of supply and demand which paints the scene with fewer suppliers of accessories, presses as antiques with befitting prices, and the lost of small papermills and type sources. In the paragraph to follow, Mr Ryder tells us that experimental letterpress printing can survive, and so provides a list of suppliers, sources for books and newsletters that surely served well the reader of the late seventies. A glossary of 134 entries has been enlarged from the first edition’s 82 terms. Mr Ryder notes that together with terms used in his book other common terms were also added, and that page numbers of first usage follow the definition. The editor’s note informs the reader that new terms will debut in italic. These two changes are among the most thoughtful organizational improvements in the book. The Fournier “Postscript” was dropped as was the “Appendix of Typefaces” the latter in favor of a new one: “The Miniature Folio of Private Presses 1960.” This appendix comprises examples of typography from his Miniature Folio of Private Presses. Here, he reprints the specimen from his own Miniature Press and six other examples, among them are the private presses of Giovanni Martersteig and Sem Hartz. Together they serve as an extended colophon. The Bodley Head edition fostered one reprint, issued by the Henry Regnery Company of Chicago in 1977.8 Although print totals for this edition have not been identified, a search of online booksellers found this edition to the most widelyavailable. In contrast, libraries tend to have either the Phoenix House or The Bodley Head edition. The Regnery dust jacket retains Ryder’s typography for the title and author name, but edited the text announcing “Foreword by Vivian Ridler.” was cut and the enlarged the type On the front flap the first paragraph of the blurb has been deleted and minor adjustments made to the remaining copy. The binding cloth matches The Bodley Head edition, but the gold stamping on the spine was reset — the title is in all caps as opposed to The Bodley Head’s U&lc setting. Textual changes are minor: the named publisher is changed on the copyright and title pages, and the list of suppliers (pp.117–18) has been modified for North American readers. The quality of the black ink is inferior to The Bodley Head edition, but the spot colors are good. On first look, the book appears to be printed offset, but close inspection of the spot colors show impression in the paper. 1. Little is an unsatisfactory word to describe these presses. While it does infer modest numbers of output issued in small quantities, the phrase has a derisive ring to it, which I believe Ryder did not intend to convey. In the 1960s, “little presses” was one phrase used to describe publishers of the literature of the protest movement. B.E. Bellamy notes in Private Presses and Publishing in England Since 1945, that the publishing of poetry was undergoing rapidly change and that “many younger writers and poets were seeking alternative ways of having their work published. One of the traditions they rejected was the letterpress printing of the private presses.” Faster and cheaper duplicating methods then appearing made the choice easy. For the first time nascent publishers could access the means of production with little capital and lead to a permanent situation that has allowed greater numbers of people then ever before to circulate their thoughts on paper. Bellamy comments that “the little presses are intent on pursuing their own way and there is very little acknowledged connection between their work and that of the private presses….” The gulf has become even greater since 1980 when his book was published. Since then one could point to the the widely divergent ‘zine culture, of the 1980s, to say nothing of internet blogging. 3. The Columbian is a curious choice because in chapter 2 “A Small Press for the Miniature Workshop” Ryder states the Albion is more commonly available in Great Britain and sites that by 1862 no less than 4,300 had been made. Given that he recommends that the reader should acquire a much smaller press, it is curious that he used this press instead of one of the two Adana illustrations from the text. 4. Another title published by Phoenix House to use the form “— for Pleasure” was published on painting. An internet search of library and bookseller databases located similar titles on other subjects such as poetry and woodworking with contemporary dates, but these were issued by other publishers, and so it appears that “— for Pleasure” was in common usage, did not constitute a particular series, and was not trademarked as is the practice today. 5. The Teach Yourself series, with over 40 titles, are easily recognizable by their uniform bright yellow and dark blue dust jackets. 6. The exhibition booklet states that this graphic, a woodcut perhaps, is John Ryder’s bookplate designed by Yvonne Skargon in 1969. It also appears at the top of Mr Ryder’s personal letterhead. 7. Referenced here in James Moran’s Printing Presses, 1978 p.58 Although originally published in 1973 and listed in Printing for Pleasure‘s bibliography in the Bodley Head edition, Ryder likely procured it from either from Savage’s Practical Hints on Decorative Printing, 1821 (as did Moran) or from a stock image in a distributor’s catalog. 8. Why Henry Regnery was the U.S. publisher of Printing for Pleasure and not, say David R Godine, is unknown. (Regretfully, I did not not ask Ryder in the only letter that I had time to send and which to receive his reply.) Regnery published the writings of Konrad Adenauer, and William F. Buckley whose God and Man at Yale, was touted as “a touchstone of modern conservatism … created a sensation but was a disaster for the young publishing house because it caused it to lose a lucrative contract to publish the University of Chicago’s Great Books series (the company was one of the few publishers located in Chicago).” Never a truly successful company, Regnery was sold in 1977 and which was thereafter called Contemporary Books, publishing auto repair manuals and sports books. Henry Regnery died in 1996.